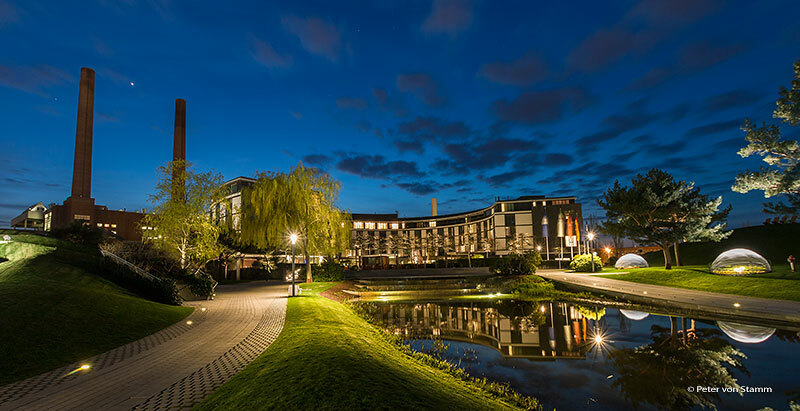 The Ritz-Carlton in Wolfsburg. From jewels to the ‚swimming‘ swimming pool and our haute cuisine adventure. 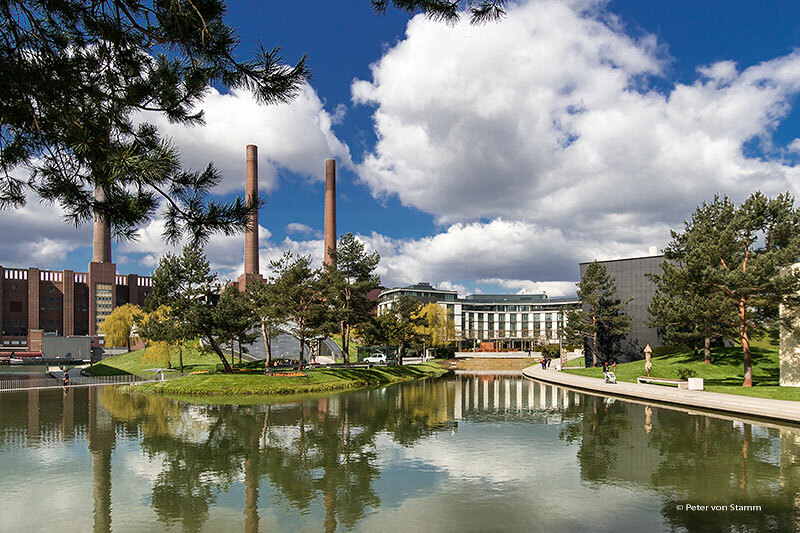 The journey to the Ritz-Carlton in Wolfsburg is along the Parkstrasse, on the grounds of the Volkswagen Motor City (The Autostadt). 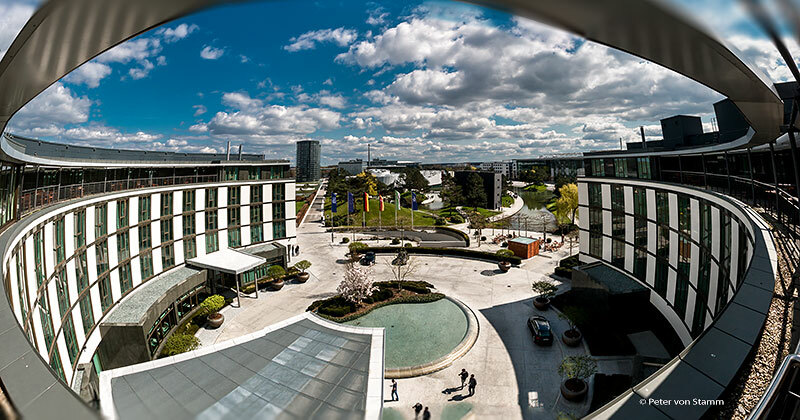 On the right, two impressive 48 metre high glass towers, each standing in a giant square water tank and containing up to 400 of the newest VW car models from the Volkswagen factory next door. 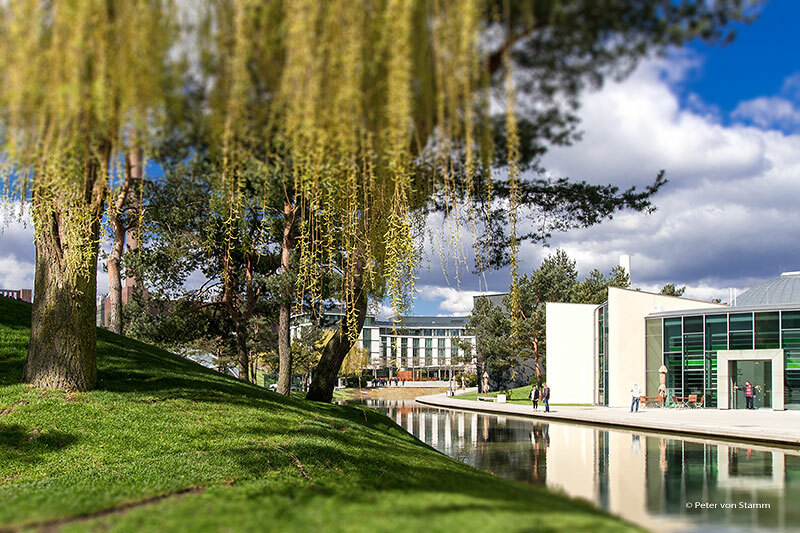 On the left, several pavilions hide behind rolling green hills and a family of geese waddle and quack contentedly through the serene park landscape. We drive on. 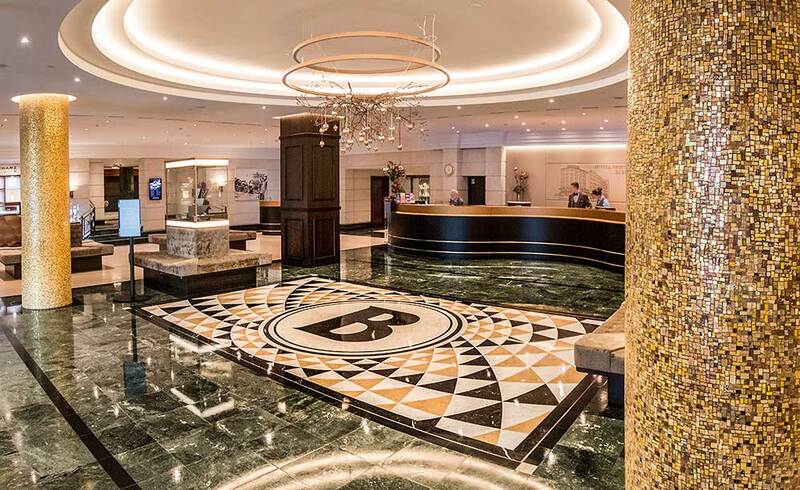 A friendly smiling member of staff greets us personally by name (after receiving a heads-up from the porter via his earpiece); takes our car keys and guides us towards the hotel entrance. He then drives our car down to the hotel’s underground car park, unloads our luggage and brings it to our room. A perfect service from the very beginning. On our arrival, six waving flags and a few chirping birds welcome us at the front of the hotel. Apart from that it’s pleasantly tranquil. Almost idyllic. We leave the reception and are led to the lifts which bring us to the fourth and highest floor of the hotel. The new ‚Club Level‘, where the Club Concierge is waiting for us to organise our private check-in. We have literally arrived and feel immediately at home. 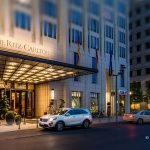 The Ritz-Carlton belongs to Volkswagen and is part of the Motor City (The Autostadt). An impressive blend of amusement park for car fanatics and the world’s largest delivery centre for new VW cars; resurrected and conveniently placed right next door to their factory by Volkswagen in June 2000. The hotel was the first Ritz-Carlton in Europe. A daring decision seeing as Wolfsburg was known only to car fans as the VW location at the time. 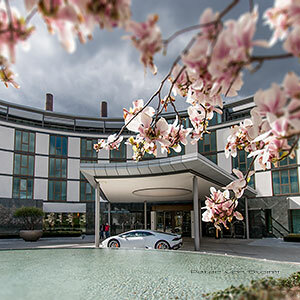 Volkswagen wanted exclusivity and only the best of the best which included the hotel. Ferdinand Piech himself came up with the idea to crown his Motor City with a Ritz-Carlton. 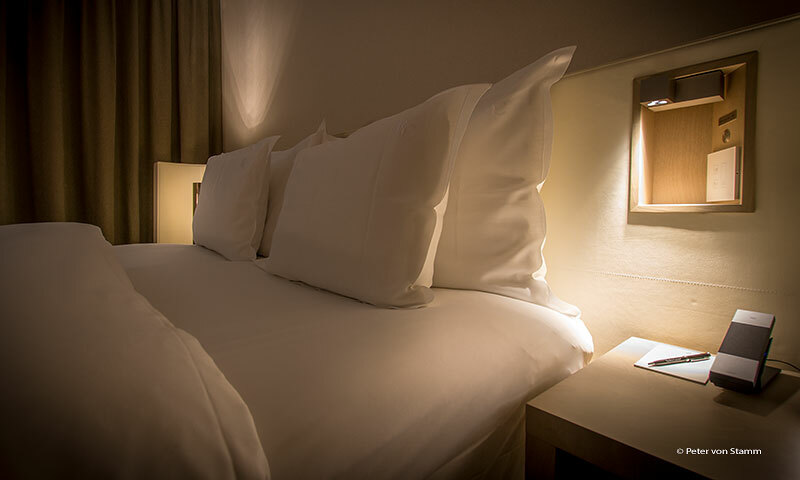 All 174 rooms and 23 exclusive suites were designed at the time by the top French Designer Andrée Putman,who had a perfect understanding of giving the hotel a combination of the upmost modern luxury paired with French effortlessness. 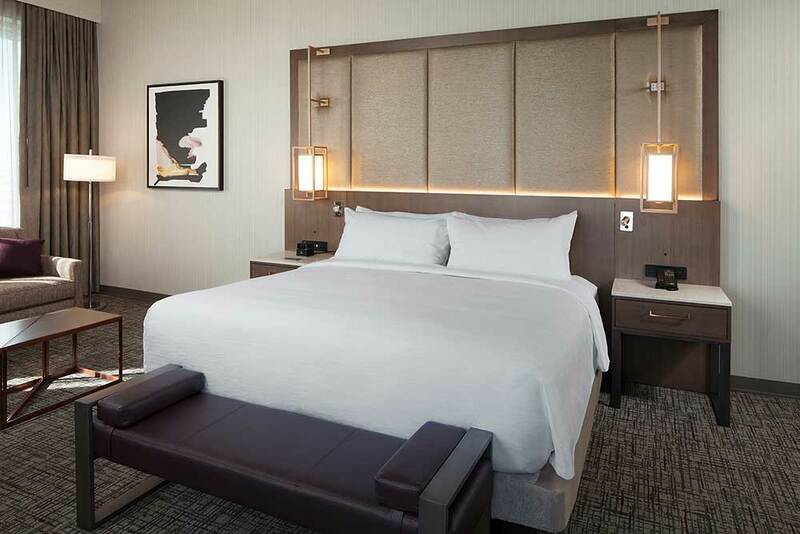 Thirteen years after the opening, the hotel was redesigned and in the hands of French architect Elliott Barnes, a former project leader of Ms. Putman’s. The renovations took a little over a year during which the Ritz-Carlton operated normally. Freshened up and improved so to speak and everything became a lot lighter, friendlier und more spacious. 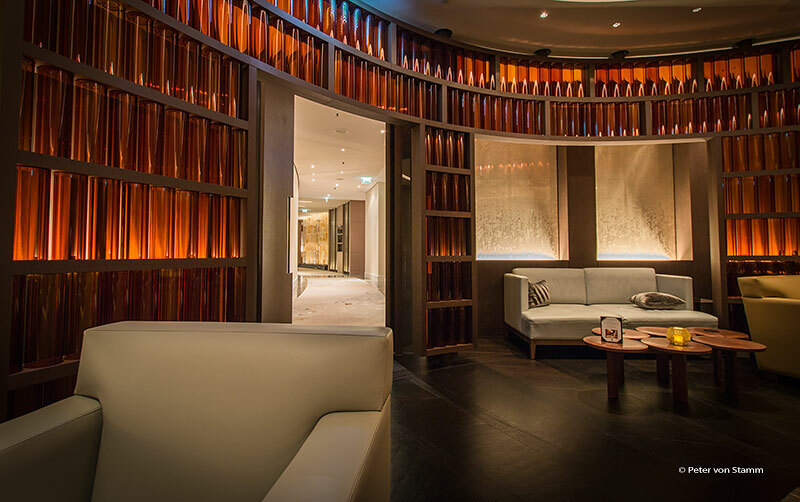 The ‚Club Level‘ is also new; a particularly exclusive hotel within a hotel. Standing up here on the fourth floor balcony, it feels as though the wings of the semicircular building just want to embrace you. Gazing upon the Motor City area in its birds-eye-view entirety, the plant looks like a spilled out treasure trove. The park-and-water-world embedded car pavilions remind you of scattered gold and silver coins; the rounded open building of the Ritz-Carlton, like a valuable diamond ring whose jewels are not on outside but rather within it. Such a jewel is Marven Joe Franzus. He is the concierge at the Club Lounge and can almost read minds. Those who arrive on the Club floor have usually come from a rigorous working day or a strenuous trip. Such guests especially, are looking for peace, relaxation, discretion and a service of the highest niveau. For those looking for a professional service in a particularly pleasant atmosphere, then you will be more than happy here. Accepting our welcome champagne (of course!) 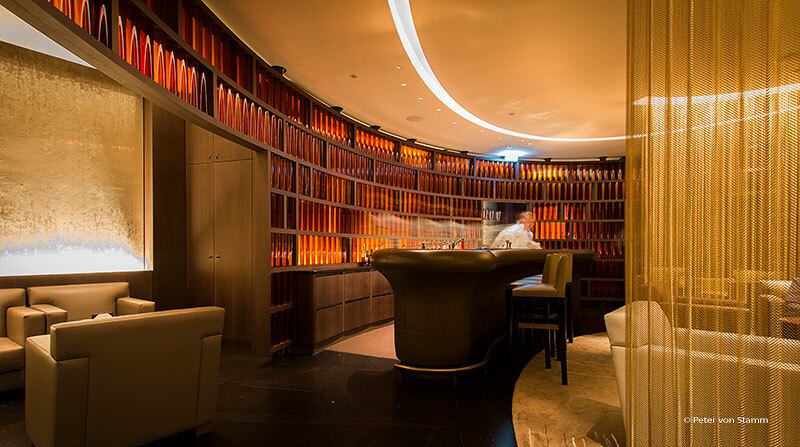 and settling down in the Club Lounge we meet another hotel jewel, Nils Braune; the chef on the Club floor. Mr. Braune serves us fresh asparagus cream and beef broth soup. With the library behind us, filled with books, coffee-table books and international newspapers, we cosy up in front of the inviting fireplace and enjoy the homely living-room atmosphere. And talking about luxury: You cannot forget the other floors. 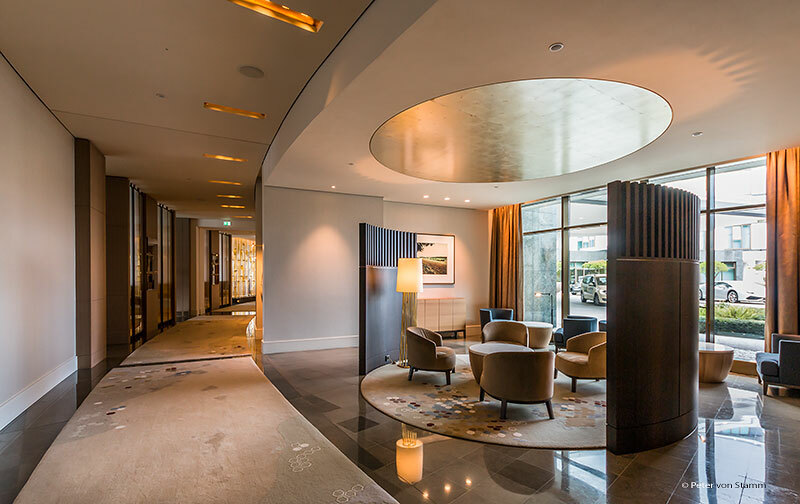 For example the ground floor central lobby lounge, with its discreet French interiorly elegance. Comfortable sofas and chairs in warm brown, beige, sand and blue tones which invite you to dream. A curtain made from golden-yellow lit glass tubes at the entrance symbolising an abstract forest and epitomising the fusion of the park landscape with the hotel. 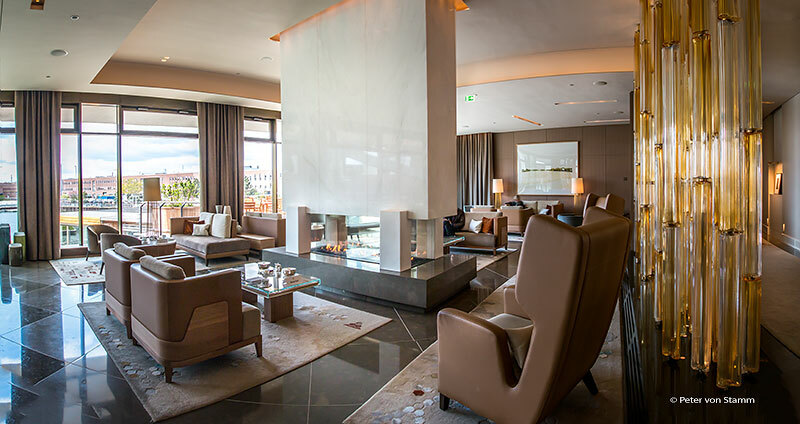 The middle of the lobby is dominated by a white marble fireplace which gives the space a feeling of a safe haven. In the afternoon the Ritz-Carlton’s typical Afternoon Tea can be enjoyed here, which has become so popular that your chances of getting a seat without a reservation are virtually zero. 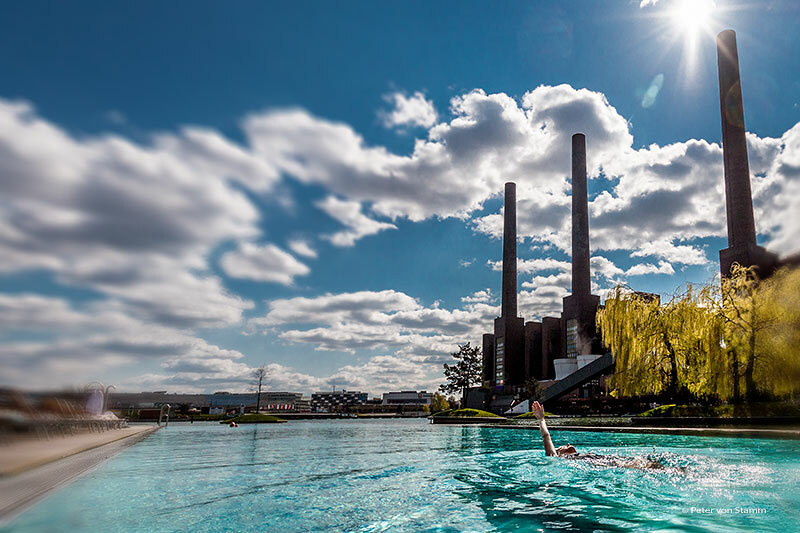 A huge window front gives you a view of the four impressive 125 metre high towers of the old VW coal power station and remind you of where you are. In the middle of a huge industrial complex; the main plant of the VW Group. In no other place could you be so impressed by the stark contrast of production and hard work on the one hand and luxury and wellness on the other. Such as the 40 metre long Ritz Carlton pool. Attached by chains and floating directly in front of the hotel in the dock. 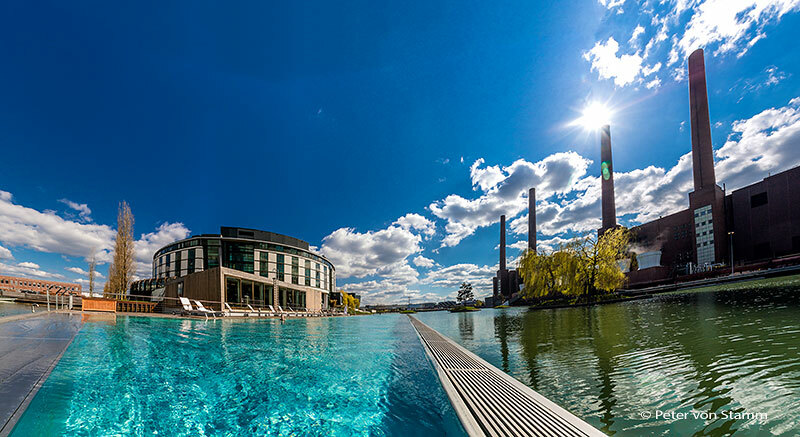 The water of the ‚swimming‘ swimming pool is at a constant pleasant temperature of 29 degrees. Who takes a dip in here will certainly not want to come out. But we did finally manage to get out of the pool because a culinary happening was waiting for us. Out of the water and into the ‚Aqua‘, THE restaurant at the Ritz-Carlton. 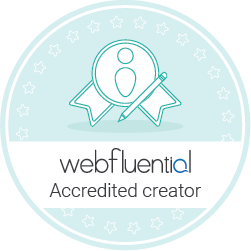 The awards and ratings of Aqua speak for themselves. 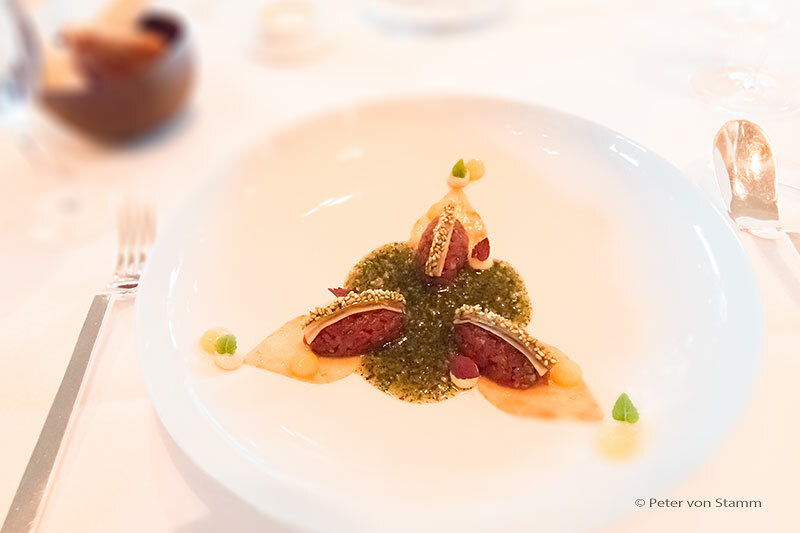 Three stars from the Michelin Guide, 19 out of 20 Gault Millau points and the highest grade 5F from the exquisite culinary magazine Feinschmecker. 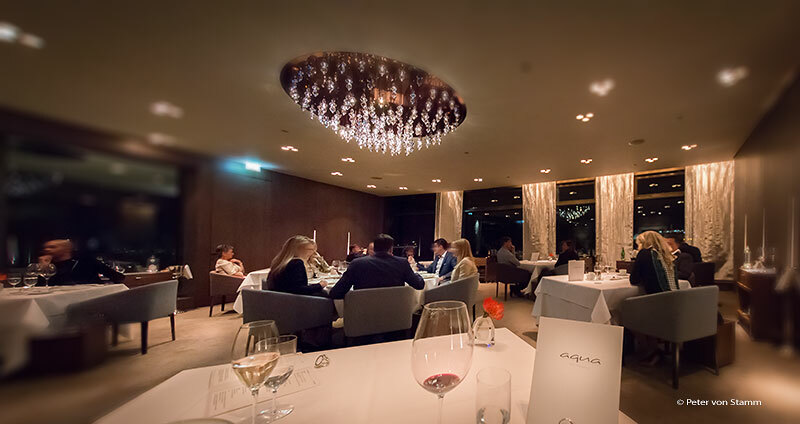 The Aqua is named Germany’s best restaurant and currently holds the 28th spot from the San Pellegrino Best Restaurants of the World Awards. So without further ado we naturally wanted to see and taste it for ourselves and see what all the fuss was about. 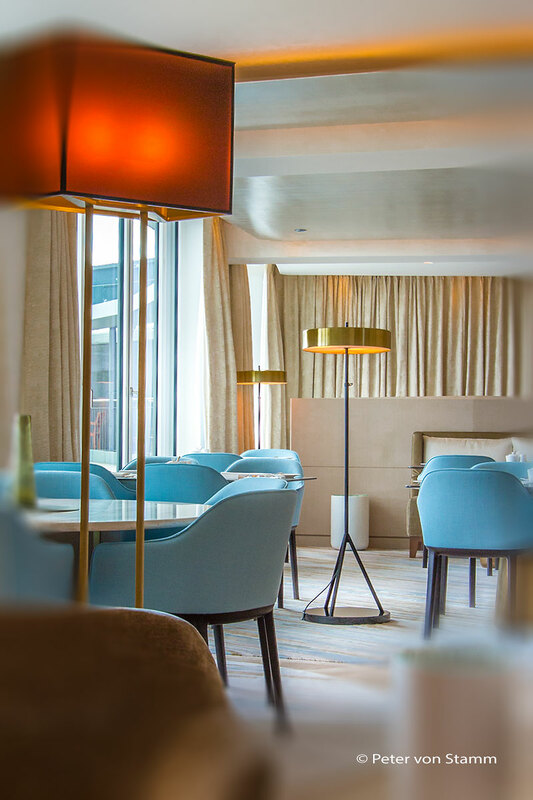 The Aqua is not a conservative restaurant; unlike many other first class venues. This gourmet temple is wonderfully lively! The atmosphere was electric with guests galore as merriment and laughter. There were two menus we could choose from. One with seven courses and the other with nine. We went with the ‚smaller‘ one! Our first surprise was the Amuse Gueule in three stages. From caramelised Kalamata olives (delivering a taste explosion); over-sophisticated mini-soups such as kefir, yellow beetroot and dill to a cream made from guacamole and smoked corn-foam, refined with yellow-fin mackerel and topped with black quinoa. A magnificent prelude. During the rest of the evening a culinary extravaganza followed with an asian-style tatar of beef with coriander, miso and yuzu (wonderfully fresh and fruity-limey), a river trout, sensationally tender and cooked at the perfect temperature. Sweetbread and Perigord truffle (not everyone’s cup of tea) and organic chicken cooked in olive oil from the Wattenheim region. And not forgetting the unrivalled champagne cream sorbet in between, followed by a dessert of cheese plate; an intensive fruit and chocolate composition and homemade pralines. All in all, 12 points! Our verdict: Speechless and gobsmacked. Yes, it was definitely worth it! Seven courses over nearly six hours. A new record for us. The culinary creations convinced; the intensive taste explosions; unforgettable. The cakes and sweets managed to surpass themselves. But not just that, what also won us over was the perfect and charming service. Another jewel to the collection, Chef de rang Sarah Palm. 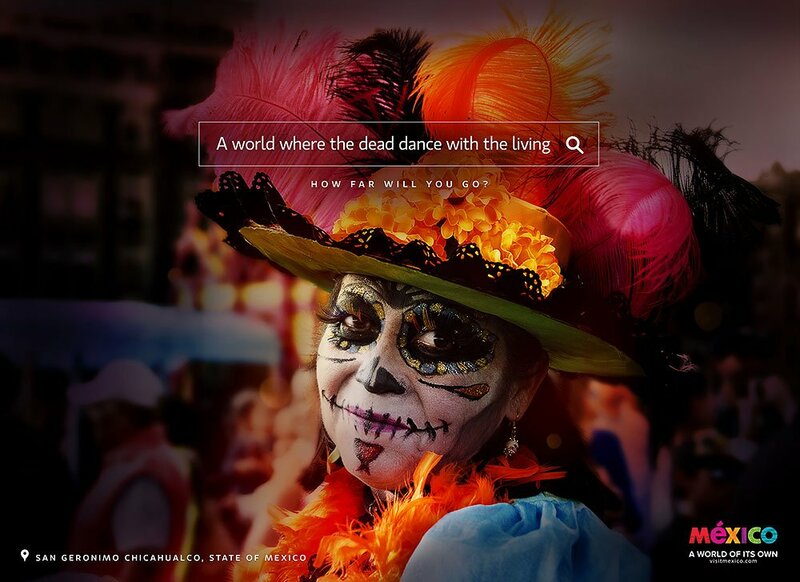 She convinced us with her expertise, friendliness and elegance. 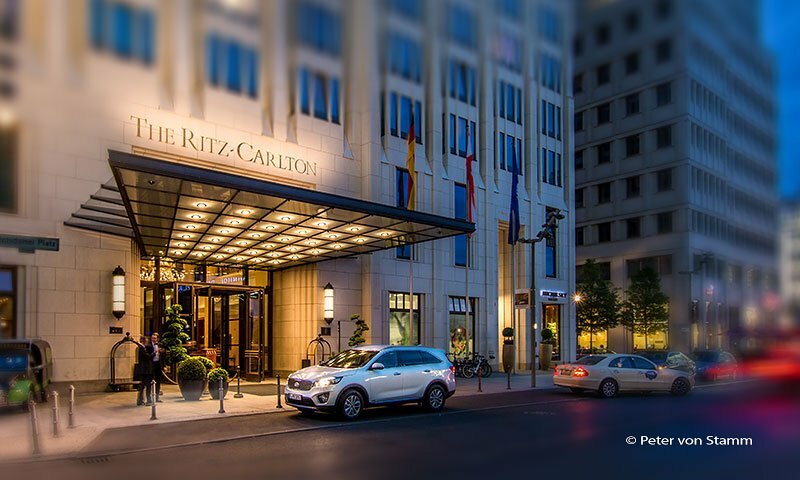 She only added to our special memories of the Ritz-Carlton in Wolfsburg. Our two nights at the Ritz Carlton (sadly) flew by. After we had checked out we took one last stroll through the Motor City. Whilst doing so, our Club Concierge transferred our luggage from our room back into our car. After which our car was driven to the front of the hotel. We find two lovingly prepared bottles of water for our homebound journey in the front. A perfect service right to the very end. Unforgettable – The comfortable bright room with a view of the docks and the power station. The intimate breakfast in the Club Lounge. The ‚swimming‘ swimming pool. 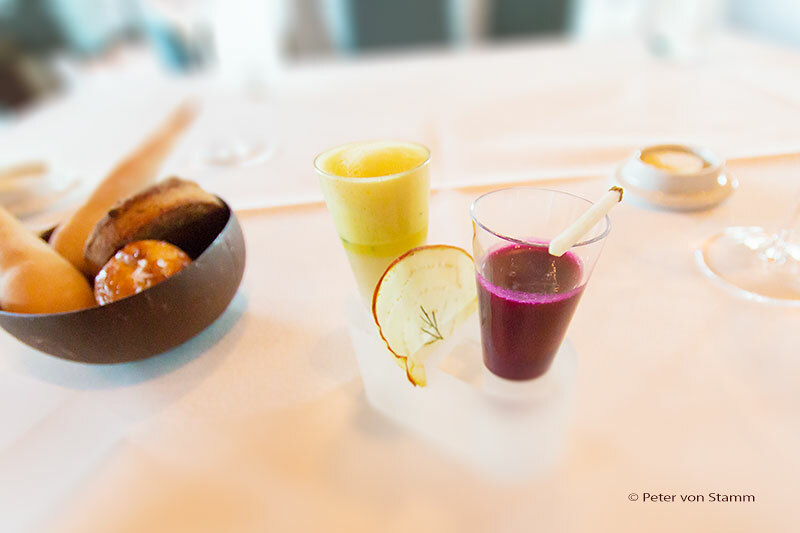 The finely concentrated aromas during our haute cuisine adventure at Aqua. The peaceful evenings in front of the hotel after the Motor City’s visitors had dispersed. But above all, the hotel’s jewels – The staff. Most of all Marven Joe Franzus, Sarah Palm and Nils Braune. 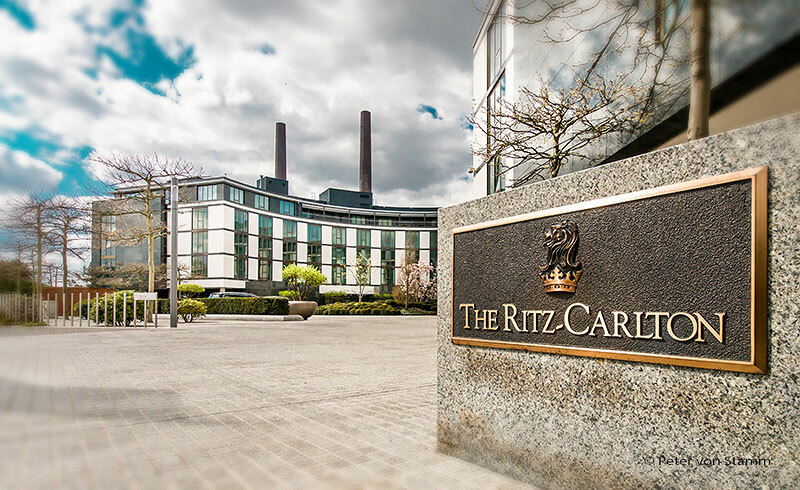 We can say that without a doubt that it is entirely their fault that the Ritz-Carlton has become our absolute favourite hotel chain. 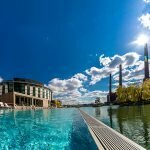 The 5-star-superior luxury hotel Ritz-Carlton in Wolfsburg, Germany: A review - and a gourmet adventure at the Aqua Restaurant.